Little did I know how awesome life could be if I just had a gorilla. 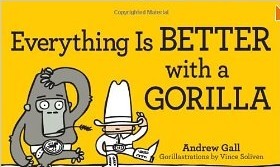 Thanks to Andrew Gall and his wicked clever book “Everything is Better with a Gorilla” I now know better. For example, did you know that washing dishes with a gorilla is better than doing it alone? Why, you ask? Because the mountain gorilla’s fur can double as a dishtowel. Amazing! Ooooo…and did you know that having a gorilla over for a sleepover is better? It is! Because you can talk late into the night with the gorilla as long as you understand that the conversation will, as Gall puts it, “inevitably veer toward plants.” Kids will love the quirky “gorillustrations” and parents will love the fact that real facts about gorillas are hidden between the lines of Gall’s witty and wonderful text. Trust me, you’ll go bananas over this book.